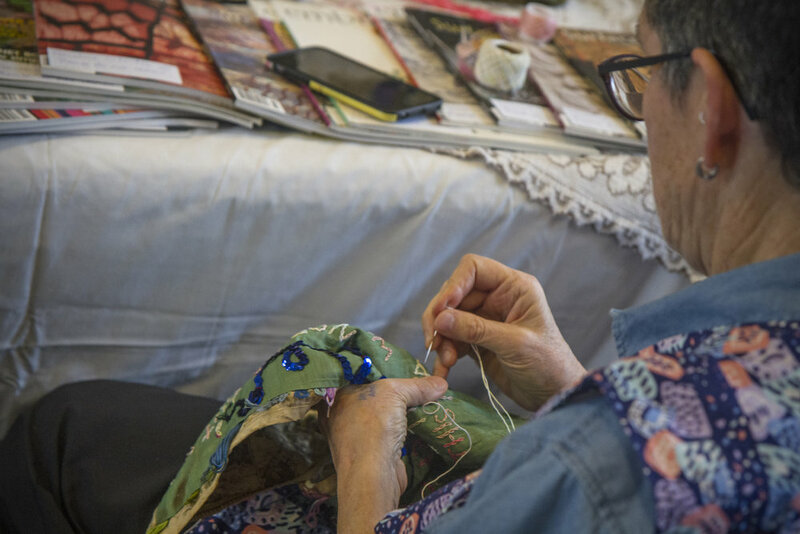 Suffrage in Stitches is a textile project devised and led by the co-ordinator and participants at Vinnies Re Sew* with the support of Wellington Museum. work creatively using historical material while strengthening family/community connections through collaborative working. give women, regardless of educational background, the opportunity to work and hang their work in a museum. broaden recent immigrants’ knowledge of NZ. 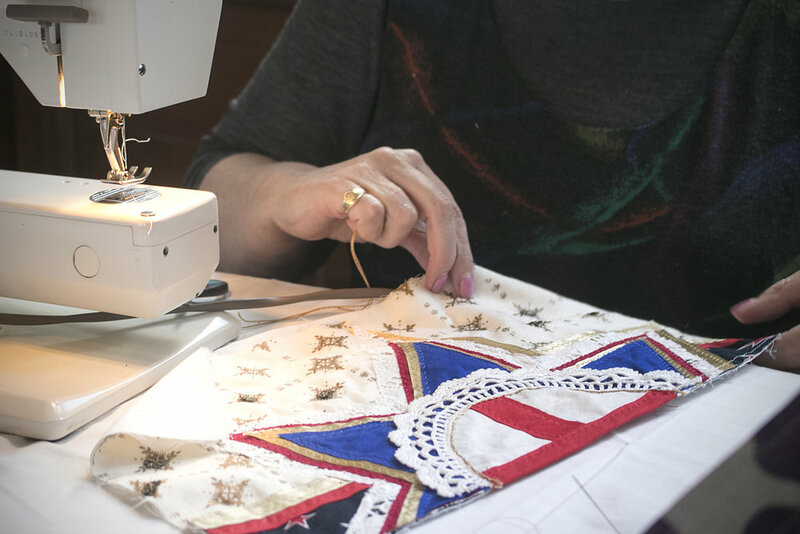 The final work will be 300 metres in length (matching the Suffrage 1893 petition), consist of 546 individually designed fabric panels (pages in the 1893 petition) by 546 makers who are NZ citizens or permanent residents. They will tell the stories of the ordinary women who signed the petition or women relatives who have influenced the makers. The final work will include the names of 546 women and over 27,000 hand stitched marks, one for each vote cast in 1893, along with multiple surface decoration techniques and a range of recycled materials which have been applied to the white cotton sheets donated by the Inter-Continental Hotel, Wellington. The project kicked off at Wellington Museum in September 2018 and has continued at our studio in Kilbirnie and at periodically at the museum. Voice Arts also joined us at the residencies, collecting audio stories from participating individuals which will be played alongside the final work in the museum during August 2019. The 546 makers were recruited via workshops, social media, and word of mouth, along with emails to schools, creative spaces, craft groups and guilds, libraries and welfare organisations across the country. As a result the makers come from diverse cultural/ethnic backgrounds and equally diverse ages, generations and skills levels. Makers had the opportunity to join a closed Facebook group to share their researched stories, provide support, and share tips and pictures of their final work. A strong community of practice has developed since September with over 514 active members, 519 posts, 3,489 comments, 19,542 likes. We’ve collected the makers personal stories of discovery and connections and will be adding these with the women’s biographies, pictures of the panels and other photographic material, to a Suffrage in Stitches blog which will accompany the exhibition. Biographies will also be submitted to nzhistory.govt.nz. The project has already had some great finds - NZ history now have a photo of the first woman to sign the petition. The work will be exhibited at Wellington Museum, Queens Wharf from the 2nd August – 31st August 2019 and will be accompanied by a range of workshops including some demonstrating the skills used on the panels. Wellington museum will be listing the work on the NZ museum database and we hope other museums will go onto exhibit the panels. We will also work with Wellington Museum to ensure the panels are available in the future for researchers and craft groups to study.